Once you have the provenance for your source, a quality of information assessment for each claim, a quality of evidence assessment for each assertion, and an analysis for each assertion, the Conclusion button will appear and the Summary Conclusion section will be unlocked. Click the Conclusion button to begin. Enter a detailed conclusion pulling together all of the analyses. As a style point, your first sentence should state your conclusion clearly, with subsequent sentences/paragraphs justifying that conclusion. 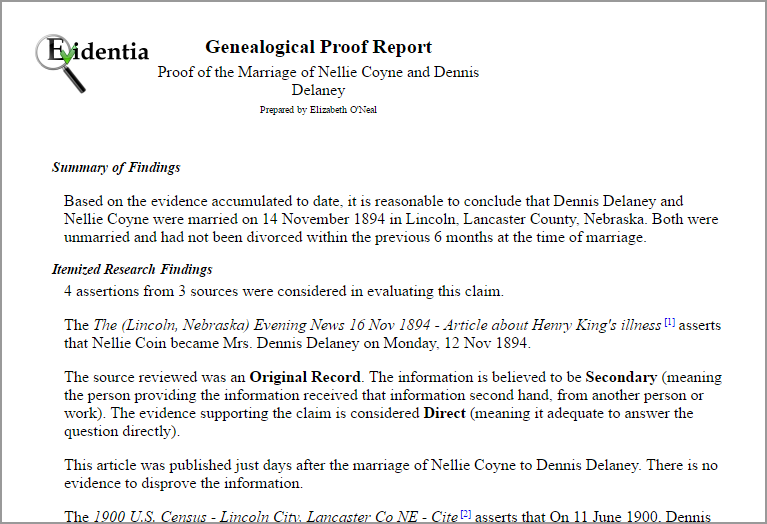 Select the Proof button to generate the Genealogical Proof Report. This is the reward for all of your hard work! Note that the Summary of Findings section is taken directly from the Conclusion box on the Analyze Evidence screen. The Itemized Research Findings section begins by indicating how many sources were evaluated to justify the conclusion. Then for each source, the citation titles are printed, followed by the assertion itself. A statement is provided based on the provenance selected for the source. The next statement is provided based on the quality of the information provided on the Catalogue Information screen. The third statement is based on the quality of evidence. Finally, the analysis itself is provided in a separate paragraph.he first time a quality statement is printed, it will be a long form version, defining what the assessment means. Subsequent entries for the same quality assessment will use the short form, simply identifying the assessment. The first time a quality statement is printed, it will be in the long-form version, defining what the assessment means. Subsequent entries for the same quality assessment will use the short-form, simply identifying the assessment. If you provided any research notes when you were working on the Analyze Evidence screen, they will be printed in the Next Steps section. Citations for all sources appear in the End Notes. Hopefully, this guide will help to make Evidentia a bit easier to use and will demonstrate the value of all your effort.